Classic cool. Curated comfort. This is The Gregory. 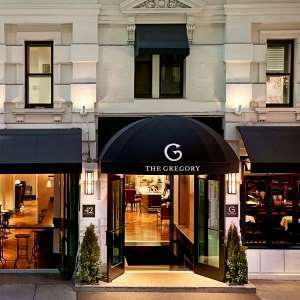 Housed in the site of the former Gregorian Hotel The Gregory is a new luxury Herald Square Hotel. NYC history culture and haute couture run through our halls. The Gregory offers an extraordinary experience for every guest. We have channeled fashion icons in order to create sophisticated guestrooms that exude contemporary flair. Modern amenities complimentary Wi-Fi and our incredible attention to detail are appreciated by both our leisure and business guests. Our standout among hotels in Herald Square offers exclusive access to legendary attractions including the Empire State Building and Madison Square Garden. Other popular attractions like Times Square Rockefeller Center and Radio City Music Hall are within walking distance. The Gregory also offers unrivaled access to major subway and train stations including Penn Station making it easy to explore every corner of the city. Book now and stay at our Herald Square Hotel. NYC is waiting. The Gregory sits in the center of Midtown near Herald Square. Our convenient location alleviates the stress of travel providing guests with easy access to many transportation options including the Penn Station subway stations railroads and taxi service. Reservation has to be cancelled 24 hours before planned arrival time to avoid a penalty of one night room and tax. Exceptions may apply - Please see rate rules. The restaurant has intricately designed beams and pillars high overhead archways a magnificent marble fireplace long narrow stain glass windows and massive upside down umbrella lighting and impressive wall decorations. It is a must to see whether you live or you are just visiting New York. Central Park is an urban park in middle-upper Manhattan within New York City. Central Park is the most visited urban park in the United States with 40 million visitors in 2013. It is also one of the most filmed locations in the world. Located in the center of Midtown Manhattan the 86th and 102nd floor observatories provide unforgettable 360 views of New York City and beyond. Whether you are in town for a week or a day no visit to NYC is complete without experiencing. Grand Central Terminal is a commuter rapid transit railroad terminal at 42nd Street and Park Avenue in Midtown Manhattan in New York City. It covers 48 acres and has 44 platforms more than any other railroad station in the world. Over the past 150 years it has become a true New York City icon. Built in 1902 Macys Herald Square was the first building to have the modern-day escalator and it has continued to be a trendsetter. Today America Largest Department Store. Located in Midtown Manhattan between 7th and 8th Avenues from 31st to 33rd Streets it is situated atop Pennsylvania Station. The Garden is used for professional basketball and ice hockey as well as boxing concerts ice shows circuses professional. Is the main intercity railroad station in New York City. Serving more than 600.000 commuter rail and Amtrak passengers a day it is the busiest passenger transportation facility in North America. Radio City Music Hall is an entertainment venue located in Rockefeller Center in New York City. Its nickname is the Showplace of the Nation and it was for a time the leading tourist destination in the city. Brightly adorned with billboards and advertisements Times Square is sometimes referred to as The Crossroads of the World The Center of the Universe the heart of The Great White Way and the heart of the world.